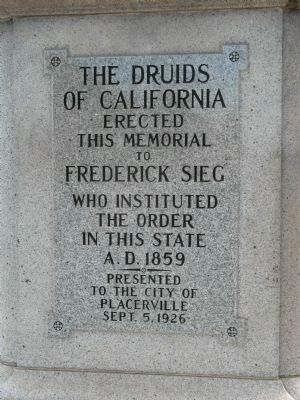 Erected 1926 by The Druids of California. Location. 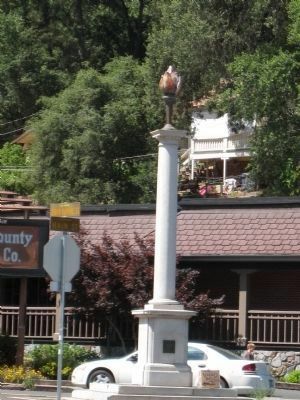 38° 43.719′ N, 120° 47.764′ W. Marker is in Placerville, California, in El Dorado County. Marker is at the intersection of Main Street and Cedar Ravine Road, on the right when traveling east on Main Street. Touch for map. 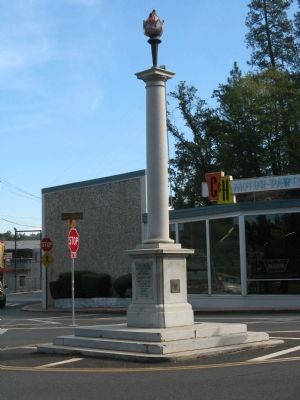 Marker is in this post office area: Placerville CA 95667, United States of America. Touch for directions. (about 700 feet away); Fountain and Tallman Soda Works (approx. 0.2 miles away); Placerville (approx. 0.2 miles away); Thomas Maul (approx. 0.2 miles away). 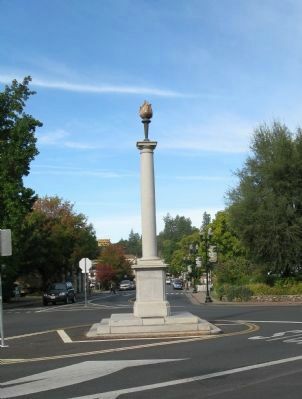 Touch for a list and map of all markers in Placerville. I am the current Noble Grand Arch of U.A.O.D. Our historian has researched the history and has confirmed the date of institution as May 7th 1860. The monument reads 1859, but no changes are planned to correct the inscription. 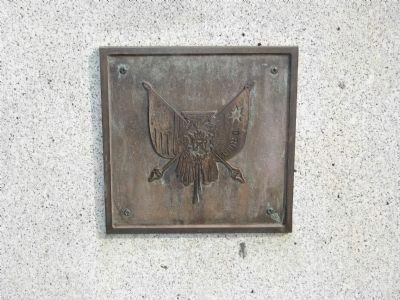 — Submitted February 26, 2009, by Richard C. Martin of Sonoma, Ca..
Druid emblem on the southern side of the monument. There is a twin on the northern side of the monument. More. Search the internet for The Druid Monument. Credits. This page was last revised on July 31, 2018. This page originally submitted on October 20, 2008, by Syd Whittle of El Dorado Hills, California. This page has been viewed 3,566 times since then and 13 times this year. Last updated on February 25, 2009, by Richard C. Martin of Sonoma, Ca.. Photos: 1, 2. submitted on October 20, 2008, by Syd Whittle of El Dorado Hills, California. 3. submitted on June 27, 2009, by Stephanie Carlson of Placerville, United States. 4, 5. submitted on October 20, 2008, by Syd Whittle of El Dorado Hills, California. • Kevin W. was the editor who published this page.